A man accused by Northern Ireland's Sunday World of being a commander in banned terrorist group the UVF has failed in a High Court bid to stop the newspaper writing about him. Colin Fulton sought an injunction under the Harassment Act 1997 stopping the Sunday World publishing articles suggesting he was involved with the IVF. He also sought damages over pieces which appeared between September 2012 and January 2014. 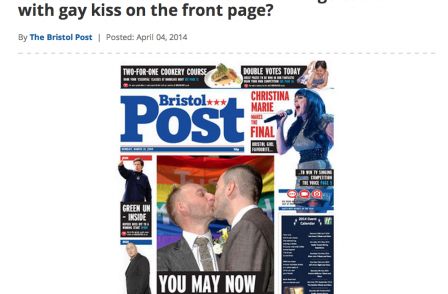 He has opted not to sue the paper for libel. Rejecting Fulton's interim injunction application, Mr Justice Gillard said the Sunday World was publishing “legitimate information concerning serious criminal activity”. Last month an alleged Republican paramilitary lost a similar injunction bid against the Sunday World. 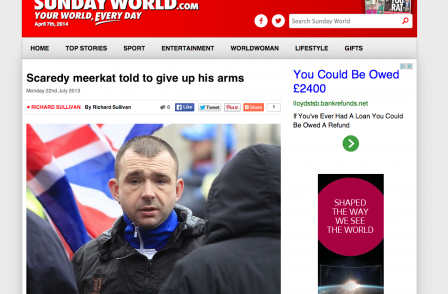 The Sunday World described Fulton as “Commmander Meerkat” and said he was a “UVF thug”. The Sunday World published photos of him with known members of the UVF and said he was involved in an incident where a 15-year-old boy was tortured with a taser gun applied to his groin. Fulton has received a number of warnings from the police that his life was in danger. Fulton concedes that was in arrested in 2013 and charged with disorderly behaviour. He says he rarely stays at home because of threats and has received abuse from strangers in the street because of photographs appearing in the Sunday World. The Sunday World’s Northern Ireland deputy editor Richard Sullivan declined to reveal who his sources are, because he said it would put their lives at risk. But he said “the articles concern serious matters of public interest in the exposure of serious crime and reporting upon paramilitaries in Northern Ireland”. Fulton had been photographed at numerous protests “most of which involved paramilitary riots” and on one occasion alongside two “convicted terrorists”, the Sunday World told the court. The Sunday World argued that the threats against Fulton were a response to “his own conduct and assocations” and did not correspondond to the dates of its coverage. He said that at least two of six verified threats to Fulton were issued before the articles. the grim truth and the dispiriting reality is that in the context of the situation in Northern Ireland those who persistently associate with known paramilitary members allowing themselves to be photographed in their company and who identify themselves prominently with protest groups appearing with members of the UVF, even after a threat to his life had been disclosed to him by the police in June 2012, lay themselves open to discussion in opposing paramilitary blogs and websites and expose themselves to the risk of a real and immediate risk to life”. He said that even if a link between the Sunday World articles and the death threats was proven, he still would not have granted the injunction. It is in the public interest that investigative journalism should not be impeded where it is publishing legitimate information concerning serious criminal activity. Quite apart from the UVF association, which is the gravamen of this application, the newspaper has published allegations of deeply troubling criminal activity on the part of this plaintiff associated with the UVF. .. The message needs to be sent out; criminals and their associates cannot hide behind the law. By dismissing another attempt at gagging the media, the courts have underlined the absolute public interest in uncovering and reporting on the criminal activity which is all too familiar in many parts of Northern Ireland."